Over ten thousand supporters have signed their name to the Pro-Test Petition (www.raisingvoices.net), which supports the rights of scientists using animals in medical research to conduct their lifesaving research free from harassment. Among those supporting the petition are Nobel Laureates, including David Baltimore and David Hubel1, and members of the National Academy of Sciences and the Institute for Medicine. Further support has come from science and research organizations such as the Society for Neuroscience and the American Physiological Society. The petition was launched on April 22nd 2009 during a pro-research demonstration at UCLA at which almost 800 students and scientists marched in support of the use of animals in medical research2. The rally was organized by UCLA Pro-Test (now “Pro-Test for Science”), founded by Professor David Jentsch, in response to the growing threat of animal rights extremism3, and the misrepresentation of science by “anti-vivisection” groups. 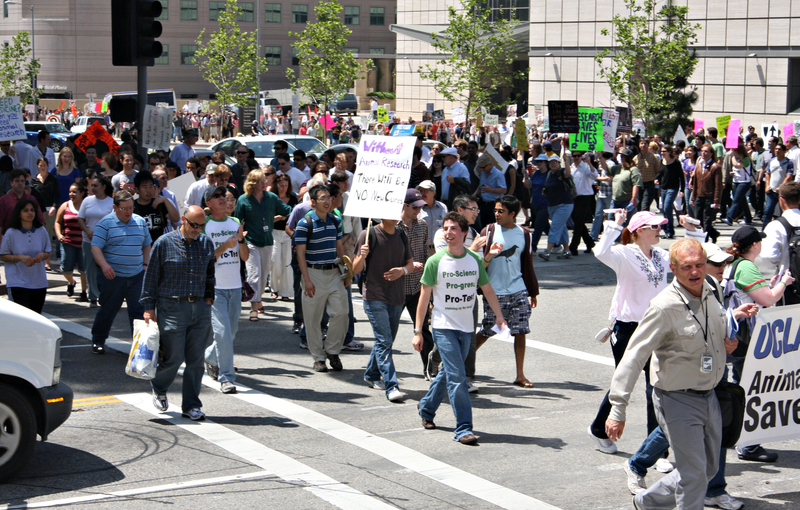 The Pro-Test Petition is jointly sponsored by Americans for Medical Progress – a non-profit that conducts education and outreach on the issue of animal research, Speaking of Research – a campus oriented organization challenging animal rights activism in the US, and Pro-Test for Science – who organized the April 2009 rally4. The organizations plan to present the petition to key lawmakers and opinion leaders in April 2010. Animal research has been crucial in the development of modern medical treatments such as new human papillomavirus (HPV) vaccine which helps prevent cervical cancer. Animal research played a vital part in the development of Insulin, Penicillin, the HIB Meningitis Vaccine, heart surgery and modern breast cancer treatments. It is also an important tool in improving our understanding of, and developing innovative treatments for, neurodegenerative disease such as Parkinson’s and Alzheimer’s disease. Posted on September 15, 2009 September 15, 2009 by EditorPosted in News, SR in the Media, SR NewsTagged American Physio, American Physiological Society, americans for medical progress, animal research, animal rights activism, animal rights extremism, animal testing, antivivisection, David Baltimore, David Hubel, david jentsch, lifesaving research, medical research, Nobel Laureates, petition, press release, pro-test for science, Pro-Test Petition, rally, Society for Neuroscience, speaking of research, ten thousand strong for research, Tom Holder, ucla pro-test.